The EMCC art exhibition series is free and open to the public. Artwork can be viewed on display in the Performing Arts Center, Estrella Hall and Komatke Hall. Learn more about the visiting exhibition series and artists below. Check the EMCC Calendar for other arts events, including visiting artist lectures and art walks as part of the exhibition series. Abbey Messmer: "A Judicious Sense of What Not to Believe"
Join the Artist Talk on Sept. 19, 2016, 1:00-2:00 p.m. in the Black Box Theater of the Performing Arts Center. 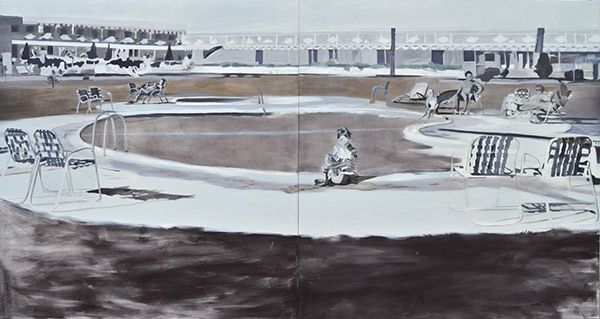 Through a monochromatic palette and sometimes glitchy visual narrative, these works take us back in time to a seemingly idyllic era of American life. Clean lines, harmony with nature and moral purity was my grandparents’ generation and like many, I'm fascinated with post war design and architecture of Eames, Neutra, Lautner and more. The forward-thinking innovations of mid-century modern life that championed convenience and optimism brought on plastics, microwave cooking and "better living through chemistry." Through these works, I'm observing the different layers of the past and recognizing both the ironic deficiencies and glorious achievements. Abbey Messmer was born in Dallas, Texas but currently lives and works in Phoenix, Arizona as a fine artist and also Programming Manager at local non-profit Scottsdale Center for the Performing Arts. She received a Bachelor of Fine Arts from University of North Texas in 2001 and moved to Arizona shortly thereafter. In her current position at the Center, she is most proud of her work serving the community through cultural awareness programs and programming outdoor music festivals that champion local music however, painting is her passion. Messmer has exhibited work at Mesa Arts Center, Herberger Theater Center, Shemer Art Center, MonOrchid and participated in a project called Art360 with the Arizona Science Center where her work was animated and projected on the dome of the Dorrance Planetarium. Messmer was a member of Phoenix art collective Eye Lounge from 2012-2015. She was a Contemporary Forum Arts Grant recipient in 2015 and her work was exhibited at Phoenix Art Museum in 2016. Join the Artist Talk on Sept. 19, 2016, 10:00-11:30 a.m. in the Komatke Hall Plaza Gallery. Ashley Macias is a fine artist and EMCC alumna currently residing in downtown Phoenix, Ariz. Her work blends the surreal and psychedelic, sometimes adding a mixture of abstract and organic elements. She primarily creates illustrative organic imagery and colorful fluid paintings that are more than meets the eye. Lately, her work falls along the visionary element as as it is created with a deep focus on the human psyche. Her vision is to tie together nature and consciousness. Read about Ashley in this recently published article on YabYumAZ. Join the Artist Talk on Nov. 21, 2016, 1:00-2:00 p.m. in the Komatke Hall Plaza Gallery. Thomas Breeze Marcus is a two dimensional painter and has been working as a full time artist since 2005. Marcus grew up in Central Phoenix by way of the Salt River Pima-Maricopa Community and is an enrolled member of the Tohono O’odham Nation in southern Arizona. 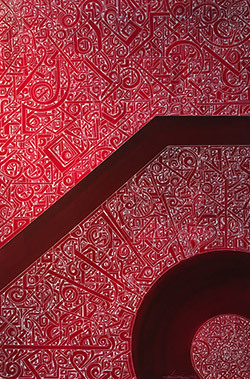 Marcus began creating work at an early age, and has worked in various mediums throughout the years, most recognizably by working in large scale with aerosol. He has developed his own signature style of detail and pattern designs which reflect a contemporary style by also showing influence from his native cultures which has caught the attention not only the contemporary art world but the Native American art world. 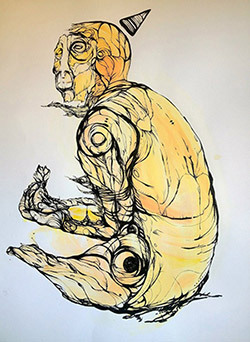 To be certain though, Marcus is very diverse in his styles of work, showcasing strength with his uniquely developed line work but also creating and interacting iconic pieces which highlight the surrounding Sonoran environment. 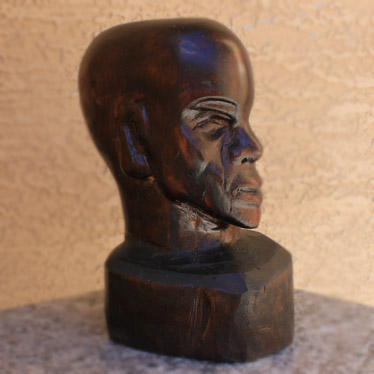 Marcus has received recognition by local Phoenix institutions and has done work for such places as the Heard Museum, Mesa Arts Center, and the Scottsdale Museum of Contemporary Arts. He has also done notable corporate work for American Express, Red Bull, Hulu, Pacifico, and Kroger Co. Aside from a promising and developing career to date, Marcus has maintained his identity as a local Phoenician by staying close to home, but more importantly has also remained close to his Native American roots and upbringing. During parts of the year, Marcus does community outreach and art instruction with at-risk Native youth on the Salt River Pima-Maricopa Community. In his personal belief, art and the creative spirit are in all of us and it is our job to continue that legacy by teaching and sharing it with future generations. Join the Artist Talk on Nov. 7, 2016, 1:00-2:00 p.m. in the Montezuma Hall Center for Teaching & Learning. Mitchell Caviness was the ninth child born into his family. In this environment, his father and mother taught him and his siblings how to create their own toys. As the youngest, Caviness worked hard to get the approval of his siblings and at age seven, he had the urge to compose a toy without supervision. Caviness' parents complimented him on how well the toy looked – they thought that his siblings had helped him make it. With this confidence, every week Caviness produced more toys not only for himself, but also for his siblings. Caviness grew up in the small town of Robbins, N.C. In this area there are many uses for the wood that is grown. At a young age he was introduced to the uses of many tools and the ways in which craftsmen use many techniques and styles. Some of these people made furniture and folk art. This art was a reflection of their past and their lifestyle. Caviness picked up on this form of art and turned it into his own; carving wood has always been a form of entertainment and lifestyle. Caviness attended the University of New Jersey in Jersey City where he received a bachelor’s degree in Art Education. From 1997 to 1999 he attended Arizona State University where he received a bachelor’s degree in Studio Art. Mitchell then went on to receive a Teacher’s Certification from Ottawa University in 2000. Caviness is a former 101st Airborne Ranger. In his spare time while in the military, he continued sketching and drawing to develop his skills and sharpen his artistic abilities. While in the military, Mitchell sustained several injuries that have left him fully disabled and legally blind. As a sculptor he can now better understand how the visually impaired really appreciate sculpture. He sincerely hopes that the sighted and visually impaired receive the intrinsic values of his work and the aesthetic qualities that he is transferring from his spirit. Caviness now resides in Goodyear, Ariz., and some of his art reflects this beautiful environment. Join the Artist Talk on Nov. 16, 2016, 10:00-11:00 a.m. in the Performing Arts Center Main Theater. There are not many people without strong and impassioned opinions about immigration, particularly the type involving people from Central and South America who unlawfully cross the U.S. border. 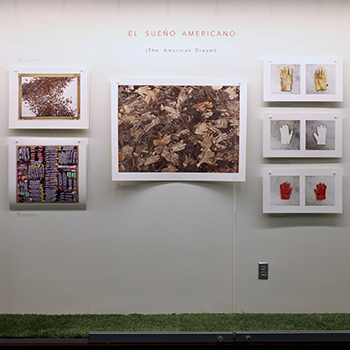 As a fine art photographer working part-time as janitor from July 2003 until August 2014 at a U.S. Customs and Border facility, Tom Kiefer had the unimaginable and unplanned experience of witnessing first hand an aspect of immigration that only a very small number of people ever see: why were so many of the personal effects and belongings of migrants, items such as rosaries, bibles, food, wallets and spare clothing being thrown away into the trash? The archive of materials collected out of the trash during the last seven years of Kiefer's employment is vast. The photographs serve as a record of the multitude of items that migrants carry when crossing the desert; food, water, shoes, blue jeans, shirts, jackets, baseball caps, deodorants, socks, foot powder, cologne, underwear, work uniforms from fast-food establishments, over-the-counter medications to numb the aches, pain and injuries that occur on their voyage, personal letters that contain information of who to contact in case they die, the photos of their loved ones to keep them going. "The project represents the humanity or lack of in regards to how these personal belongings were treated along with the people who were willing to risk their life in pursuit of the American Dream." Join the award ceremony and reception on Feb. 15, 2017, 6:00-7:30 p.m. in the Performing Arts Center. This exhibition features artwork created in a variety of media by students from the Tolleson Union High School District including: Copper Canyon, Tolleson Union, La Joya, Westview, and Sierra Linda. This visual arts exhibition gives students the opportunity to showcase their talents and their artwork on a professional stage. Additionally, this exhibition introduces students to the professional world of art through exposure to the competitive process of juried exhibitions with accompanying awards. This gives the students a sense of accomplishment while also allowing them to see the validity of their artistic pursuits and position themselves within the larger art world. Join the Artist Talk on Feb. 13, 2017, 1:00-2:00 p.m. in the Komatke Hall Plaza Gallery. Frederick Hodge is originally from central Texas. After he graduated from high school, his whole family moved to Saginaw, Mich., to join his sister already living there with her family. After spending several months in Saginaw, he decided to move to Detroit, Mich., and continued to explore the country with short stints in Muskegon, Mich., and Houston, Tex. He moved to Phoenix, Ariz, from Detroit seven years ago. Hodge has always enjoyed art from the time he was a shy, little kid growing up in a small Texas town, until now as a grandfather of four. Primarily self-taught, he specializes in acrylic painting, sketching, and pen and ink drawing. Realistic and figurative portraits are what he does best. He attended Muskegon Community College in Michigan, and graduated with an Associate in Arts from Phoenix College. 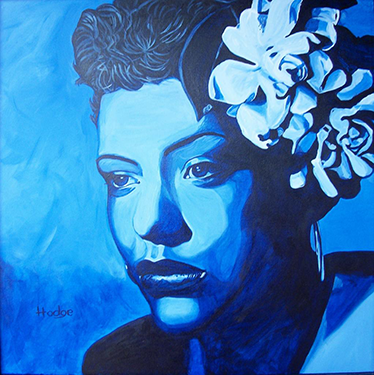 Hodge graduated from Arizona State University with a Bachelor of Fine Arts with concentration on painting. He is a member of Artists of the Black Community (ABC), a local art group. He has exhibited at a number of art shows and galleries, including some of First Friday events in Central Phoenix, Unitarian Church in Paradise Valley art exhibitions, and Fiesta Resort and Conference Center, Devonshire Gallery, and ASU's Gammage. Join the Artist Talk on March 7, 2017, 10:00-11:00 a.m. in the Komatke Hall Plaza Gallery. Constance McBride creates figures that punctuate the complexity of being human. Her sculptures explore difficult issues related to aging and mortality. Her primary medium is clay. 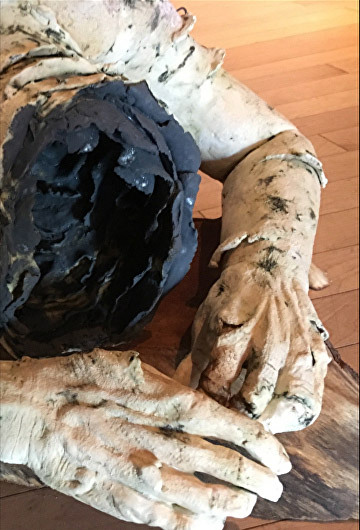 Inspired by landscape and the natural world, her work is most recently characterized by her use of dry surface treatments and her sculpting method to create contorted forms rather than images of perfection. A native of Philadelphia, Penn., McBride relocated from the East Coast to the Southwest in 2002. She studied art at Philadelphia Community College and Philadelphia College of Art before receiving her Bachelor of Arts from Arcadia University in Glenside, Penn. Her work is featured in the international platform Ceramics Now and included in the publication Paperclay Art and Practice by Rosette Gault. Most recently, it's been displayed in the ClayHouston Biennial in Texas, The Clay Studio National in Pennsylvania and in the international exhibition Beyond The Brickyard, at Archie Bray Foundation for Ceramic Arts in Montana. McBride is a 2011 recipient of a professional development grant from Arizona Commission on the Arts. She was named one of the 100 Creatives by Phoenix New Times in 2014. Phoenix New Times named her solo exhibition “Place out of Time” one of the ten best art shows in Phoenix in 2015. Most notably, in 2016, she received an Emerging Artist Grant from Contemporary Forum, a support organization for the Phoenix Art Museum. The Annual Juried Student Art Exhibition features artwork created by the talented students of Estrella Mountain Community College. This exhibition includes artworks created in a wide variety of media showcasing the breadth and depth of the Fine Arts Program at EMCC. This visual arts exhibition gives students the opportunity to showcase their talents and their artwork on a professional stage. Additionally, this exhibition introduces students to the professional world of art through exposure to the competitive process of juried exhibitions. The artwork included in this exhibition was selected by EMCC faculty and staff through a rigorous process of evaluation. Participation in such a selection process provides students with a sense of accomplishment while also allowing them to see the validity of their artistic pursuits and position themselves within the larger art world. Join the Artist Talk on May 2, 2017, 10:00-11:00 a.m. in the Komatke Hall Plaza Gallery. Thuong Nguyen was born in Saigon, Vietnam, and moved to the United States in 1975 as a refugee. He received a Bachelor of Fine Arts in sculpture from Arizona State University in 1998 and has been active within the Arizona art scene for the last 15 years. He has worked full time at Intel for last 30 years while pursuing his passion in art. His current body of work draws inspiration from the Asian landscape black ink brush painting; Zen Buddhist teaching philosophy and the beauty of the desert wilderness. 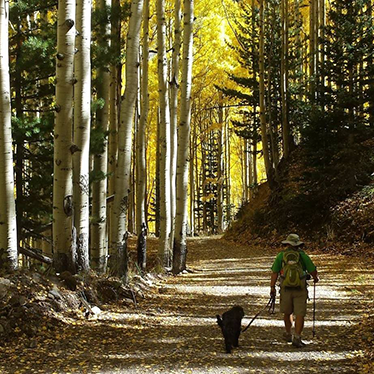 He spends his free time on Arizona trails with his four-legged companion – away from work and studio. Estrella Mountain Community College proudly presents this exhibition of artwork created by current Fine Art Faculty. The exhibition serves as a representation of the diverse styles and approaches to art making being explored by our talented faculty members working in a wide range of media. Faculty excitedly take advantage of this opportunity to share their creative practice with their colleagues and students and to connect with the community through the realm of creativity.